Installation Image, Mary Ann Aitken, Indomitable Spirit, BBAC, All Images Courtesy of DAR, except Maureen Aitken. The exhibition of work by Mary Ann Aitken, Indomitable Spirit, opened at the BBAC in the Robinson Gallery on March 8, 2019, providing many viewers with a first time look at the Detroit artist who painted her expressionistic landscapes and still life work during the 1980s from her studio in the Cary Building in downtown Detroit at Gratiot and Broadway. Aitken was born in Detroit in 1960 and attended Wayne State University where she earned her Bachelor of Fine Arts and maintained her art practice in Detroit, exhibiting locally, until she moved to New York City in 1989. Her second master’s degree in Art Therapy provided her employment at the Woodhull Hospital in Brooklyn where she assisted her patients through their medical struggles using the art process. Aitken shared her talent through art therapy in the decades that followed and continued to exhibit her work around the Detroit Metro area. She passed away after a long, four-year battle with cancer in Brooklyn in 2012. Her close friend, Detroit artist, Ed Fraga, recipient of the 2009 Kresge Arts fellowship for visual arts, has shepherded her work in and around Detroit since her passing and acted as liaison for a joint exhibition at Trinosophes and What Pipeline in 2013. 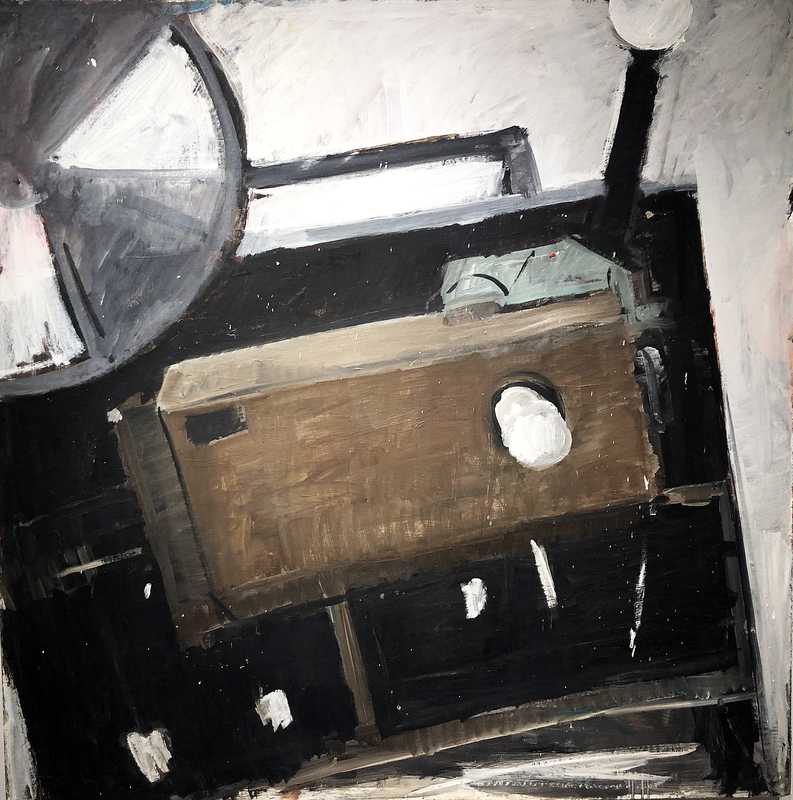 There is something in this work that draws this painter to the way Aitken handles the spontaneous use of paint while capturing a strong composition. This aerial looks down on Broadway in a way that speaks to an intuitive approach to the use of space that dominates her sensibility. She blocks in the expanse without concern about representation, exposes the brush marks and, in this work, plays with the strength in a parallelogram and the use of black line. 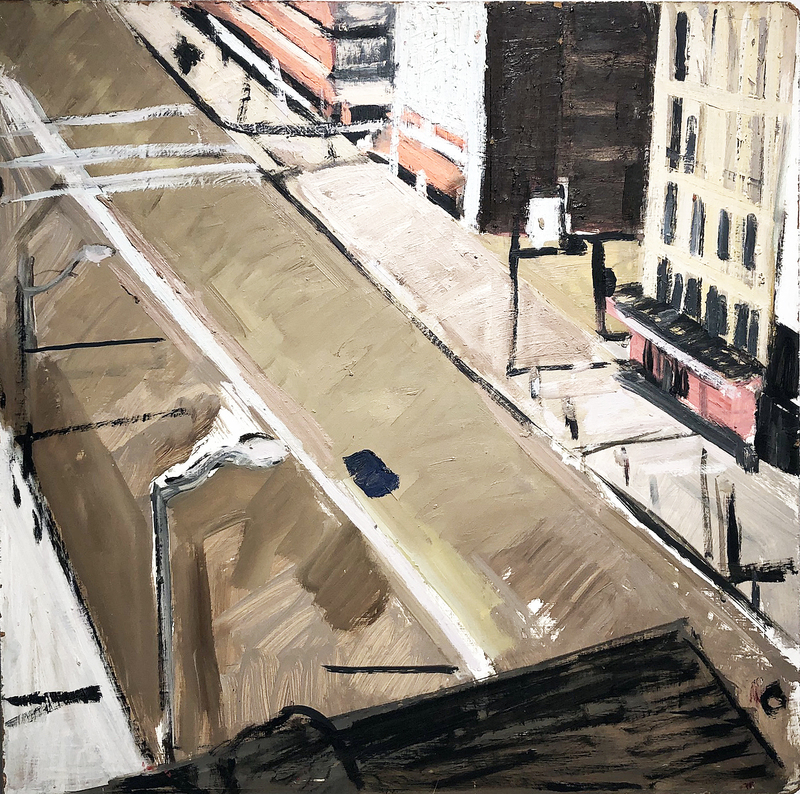 Mary Ann Aitken, Untitled, (Gratiot & Broadway), Oil on Masonite, 1985-89. Here again, Aitken is working from an elevated point of view and flirts with a naïve impression, yet there is nothing primitive about this streetscape. 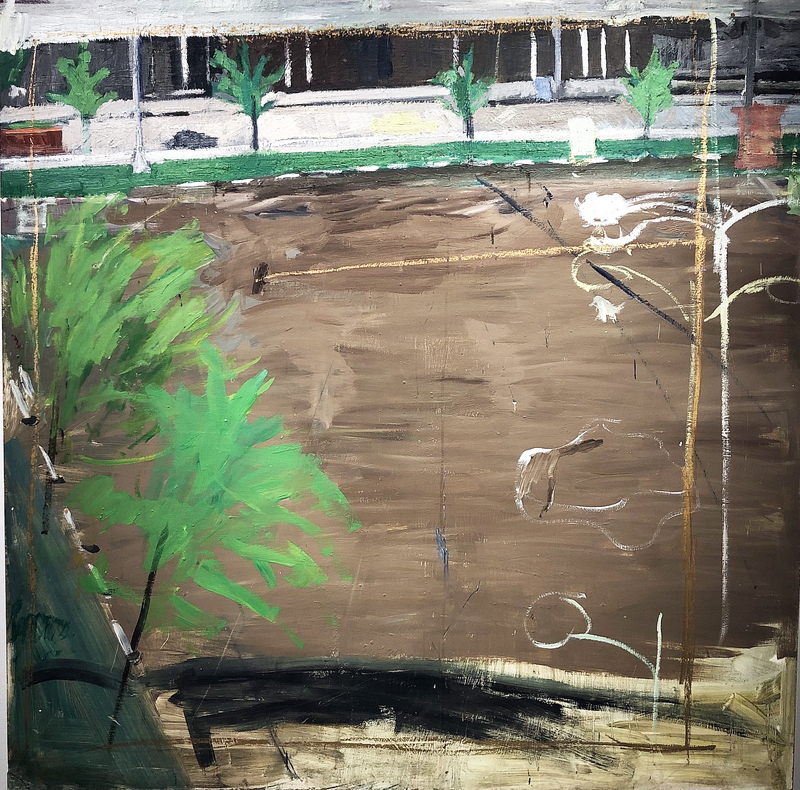 This brown boulevard dominates the composition with aesthetically raw, textured layers of paint, while paying little attention to the rendering of the trees. 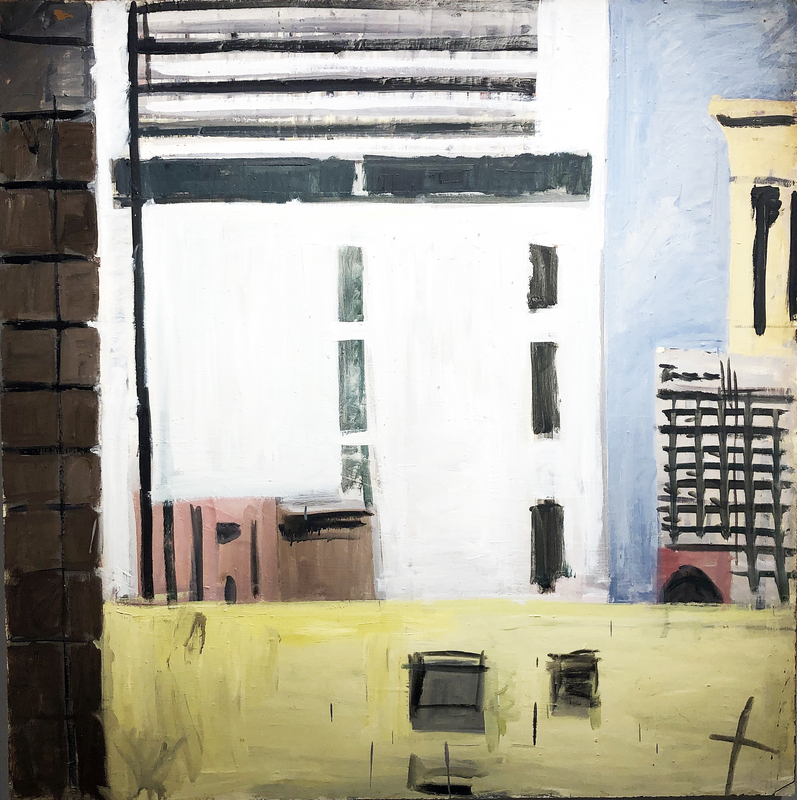 Here, Aitken’s work moves more toward abstraction than expressionistic streetscape. 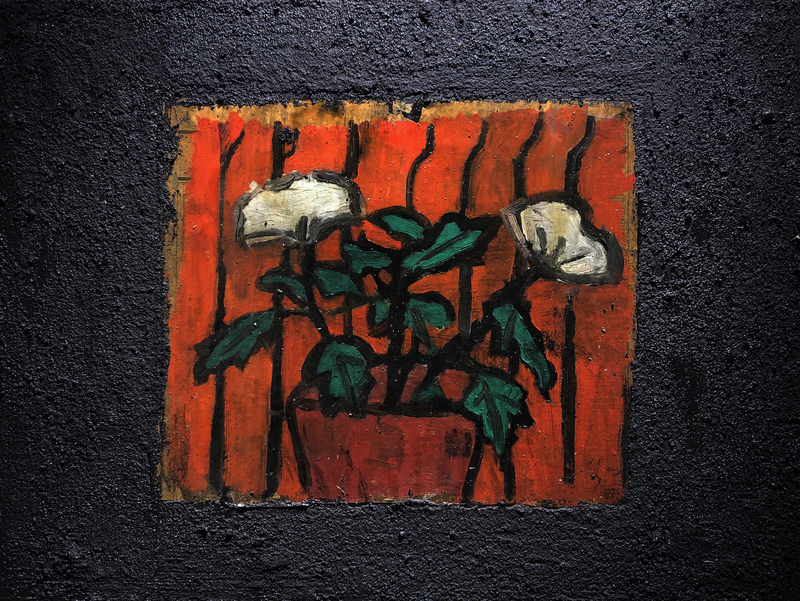 The Aitken exhibition demonstrates her interest in still life and ordinary objects as in The Projector that uses an object to paint an expressionistic abstraction with the focus on composition and the application of paint. She is dividing the rectangle with an object, not worried about representation, or color, but with concern for shape, line, and space. Aitken is using the object to facilitate her abstraction. Grabbing a view from the Cary Building using foreground, mid-ground, and background, the city becomes her grid-like painting for her sublime abstraction. Having gone to Wayne State University and studied under Robert Wilbert, there is no question she was influenced by artists Nancy Mitchnick, Michael Lukes, and Gordon Newton, but this writer is a little tired of various entities trying to capitalize on the overly used term “Cass Corridor Artist.” I say this because I graduated from the WSU graduate program in painting in 1971 and had a studio in Detroit, but I would never use that term to describe my work, and many artists would fit my profile. I am sure Aitken was there and influenced by all of it in a positive way, but also remember that she left for New York City in 1989 in search of greener pastures, much like John Egner. Is it a coincidence they both return to Detroit, Aitken posthumously and respected, and Egner with his Cass Corridor repute? As part of the exhibition, Mary Ann Aitken’s sister, Maureen Aitken attended a talk at the BBAC where she read from her book, The Patron of Lost Girls, in first person stories about her resilience in the face of injustice growing up in Detroit where the recession hit hard on Midwest families. She gives the name Megan in her story, as her sister’s name, representing Mary Ann, who provided the audience with a glimpse of family dynamics while traveling on the road and mentions her sister’s devotion to her artwork. Maureen Aitken teaches creative writing at the University of Minnesota. Mary Ann Aitken has had Posthumous solo shows at Cleopatra’s, Brooklyn; What Pipeline, Detroit; Trinosophes, Detroit; and Urban Institute of Contemporary Art, Grand Rapids, MI. Group exhibitions include Greene Naftali, NYC; Andrew Kreps, NYC (with Dylan Spaysky), Museum of Contemporary Art Cleveland; Tomorrow Gallery, NYC; Marianne Boesky, NYC; Marlborough Chelsea, NYC; and PSM Gallery, Berlin. Her work is in the collections of Wayne State University, Grand Rapids Art Museum, Flint Institute of Arts, and the Detroit Institute of Arts. Mary Ann Aitken, Indomitable Spirit, at the Birmingham Bloomfield Art Center runs through April 18, 2019.